We receive no financial support from the government, councils and few local businesses. Our average monthly expenses exceed $3000, with fuel being the main expense. Our rescues are funded mainly from our own expenses, as our average monthly donations only cover a quarter of our rescue expenses. All donations are put towards fuel, vehicle maintenance, and rescue gear. 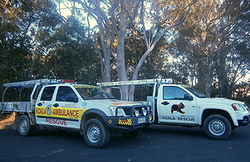 We are also desperately in need of replacing Murray's rescue truck, as he is currently using his personal work truck which is only a single cab and can only hold 2 koala cages at a time and has no space for a second rescuer to assist in rescues. Every donation, whether big or small, is highly appreciated. Please donate today to allow us to keep saving our precious Aussie icons!